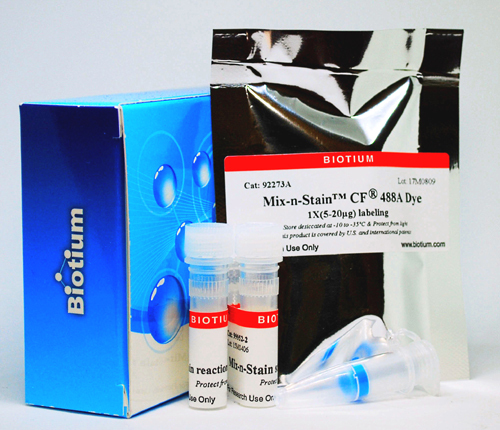 Mix-n-Stain™ antibody labeling kits dramatically simplify the process of preparing fluorescently labeled antibodies, particularly primary antibodies. Simply mix your antibody and the dye or protein of your choice. After 30 minutes and without a separation step, you will have a covalently labeled antibody conjugate that is as good as a commercial pre-labeled fluorescent antibody. Labeling protocol tolerates BSA, gelatin, and even ascites fluid.